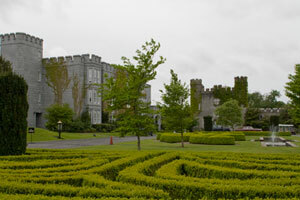 On my first night in Ireland this spring, I drove to Dromoland Castle in Ireland, where I stayed the night. This luxury hotel is considered to be one of the best in the world; I believe it! Presidents and other celebrities have visited the beautifully restored castle with its perfectly manicured grounds. The 2004 European Union-U.S. Summit was held at the castle. 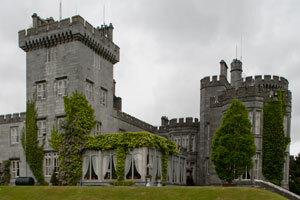 Dromoland Castle is located in the Shannon region of Ireland, near Shannon Airport. The castle was built in the sixteenth century and was the home of the O'Brian clan who were descendants of Brian Boru, the last High King of Ireland. As the brochure points out, Dromoland Castle is one of the few castle hotels that can trace its ownership back through history to Gaelic Irish families of royal heritage. 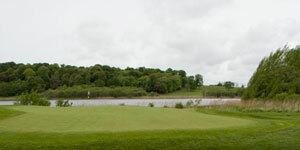 The Dromoland Castle Hotel 400-acre complex includes a championship eighteen-hole golf course, spa, swimming pool, and exercise facility. 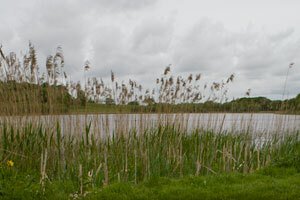 Other activities offered include fishing, horseback riding, archery and clay pigeon shooting. The staff at Dromoland Castle is extraordinarily accommodating and pleasant. I checked in and had a fabulous dinner in the Earl of Thomond Restaurant. The waiters were amazingly helpful and friendly. The food and wine were outstanding and, I am told, award-winning. Dromoland also has a less formal restaurant called The Fig Tree. The Castle Library has a bar and log fireplace which provides a venue for music and after dinner drinks. After my meal, I went to sleep in a beautiful five star room. Before bed I even tried a little of the whiskey and honey mixture and complimentary chocolates which were provided in the room. If you want to feel like Queen or King or President for a Day, visit Dromoland Castle in Ireland. The facility and service are beyond compare. If you get a chance to go to Dromoland, you will not be sorry. The prices are high and the experience is worth every penny. 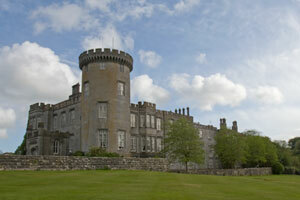 Dromoland Castle is just eight miles from Shannon Airport. When you exit the airport, take N19 (signposted Galway, Limerick, Ennis). Continue on N19 (all routes). At the Shannon Town Roundabout take N19 (Galway, Limerick). Then follow the signs to merge onto N18 (signposted Galway, Limerick) and drive toward Ennis for six miles. Exit at the Dromoland Interchange onto R458. The castle gate is on the left after 200 yards. The golf course is inside the gates and the hotel is farther on. Nearby are the popular visitor attractions of Bunratty Castle & Folk Park, the Cliffs of Moher, the scenic beauty of the Burren and the vibrant cities of Galway and Limerick.